There are 9 reviews of Patchouli Noir / Patchouly Noir. A smooth, smooth start: a soft, sonewhat creamy patchouli with cedarwood. The cedar is without much pencil-shaving characteristics and both notes mix very well. A slightly minty undertones provides a bit of freshness. In the drydown a transient slightly chocolate-like background chord is added, but heading towards the base the other main player is a soft vanilla impression. This vanilla is neither intrusive not cloying and seamlessly seeps into the whole, adding a pleasant and somewhat restrained sweetness. The sillage is moderate, the projection good, and I get eight hours of longevity on my skin, the last couple of hours, however, very close to my skin. This lovely autumn scent is quite wearable for all occasions and has a more formal feeling to it. It is beautifully blended and one of this house's showpieces. 3.5/5. 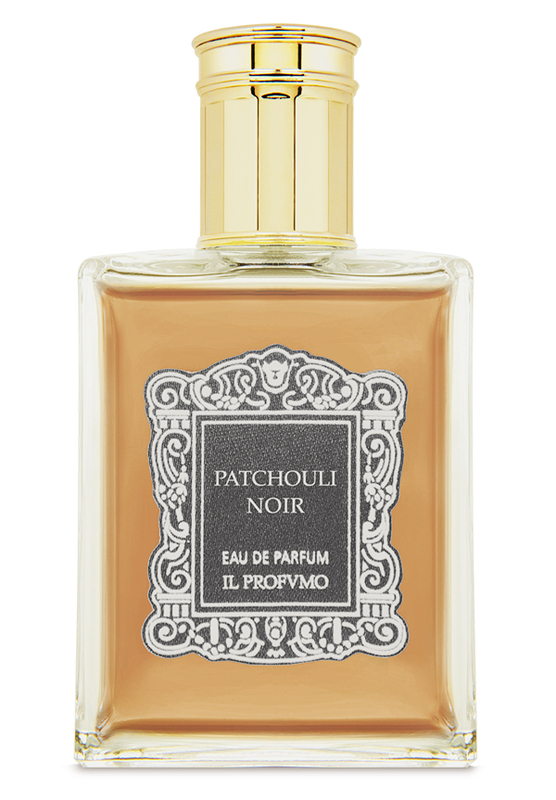 Il Profumo PATCHOULI NOIR is my first experience with this house, and I have to say that I am impressed. This composition is truly beautiful and remarkably well-balanced, avoiding all of the excesses that so often mar patchouli perfumes. Yes, the patchouli is detectable from start to finish. No, it is not overwhelming. Yes, the noir element is important. No, it does not drown out the patchouli. There is a touch but only a touch of dirtiness here, and the golden, only slightly sweet drydown is simply a dream come true. I would describe the overall effect as similar to a smooth layer of very lightly sweetened caramel. It's as though the texture of caramel were captured but with only a fraction of the sugar. I've had the pleasure of wearing PATCHOULI NOIR twice now, and I can honestly say that I love it! A palatin fragrance perfect to stand out in a gala night at Kremlin or Versailles. An artistic patch's rendition, culturally lofty, baroquely decadent and aristocratically libertine. This is Il Profvmo Patchouli Noir, one of the best elements of my heavy arsenal. I use to layer it with a touch of Habit Rouge in order to create the most sumptuous, baroque and regal fragrance ever coiceived, suitable for cerimonies at Royal Palace. In the same vein as Parfumerie Generale Coze but less spicy, more floral and more "vintage patchouli-centered" (and frankly more "elevated" as fragrance). Il Profvmo Patchouli Noir is sumptuous, exotic and mysteriously decadent as a nobiliary palace, ghostly and labyrinthian. It's a patchouli dominant fragrance whose all the other notes, hints of vanilla, cedar, mint, a touch of frankincense, cocoa and poppy, circulate around the earthy note of patchouli, in order to get it smoother, softer, luxuriant and naif. It's a pretty obscure creation, so bold and charismatic because of the accord between balsamic elements and patchouli, but it's also lush and chic because of the velvety and aristocratic sweetness provided by vanilla, supported by a glamour and oriental hint of poppy. The patchouli's darkness is enhanced by a greedy touch of dark cocoa, quite irresistible and posh. The general balance is sheer. A "neutral" and classy cedarwood is starring on the side of musky patchouli, the note of vanilla is well calibrated and licentious, spicy resins push up the general nobiliar sense of exoticism, the aromatic mint imprints since the beginning an almost mentholated-camphoraceous trail while a voluptuous floral note and a delicious amber/tobacco stress the lingering nocturnal decadence of the juice. Layered with an hint of Black Tourmaline Durbano (or with frankincense's pure oil) it becomes something spiritual and transcendent. Il Profvmo Patchouli Noir is a superb creation that manages to lord over all the other scents of the Royal House's ceremony. Great Patchouli. It's not a sillage monster but it lasts fairly. The smell is fantastic. I've never been a fan of patchouli, but this one is so good that has changed my mind. If you stumbled upon this review because you are interested in sampling Il Profvmo, you're probably scratching your head right now. Patchouli as the top note? Florals as the base? But yes, from the alpha to the omega sniff, it's savory, resinous, don't-hate-me-because-I'm-beautiful Patchouli. I like the mint burst in the opening, it's refreshing and unexpected. The middle act is very 'Western' to me. Think moccasins lined with sheep's wool; campfires crackling with cedar logs; and incense sticks smouldering on a rock. And then...no you aren't hallucinating ...the delicate smell of poppies and the luscious, seductive scent of vanilla. There are no member images of Patchouli Noir / Patchouly Noir yet. Why not be the first?